Slots only. Rather small parking lot since some of it is marked off as "Valet Only" -- however, after us, some other campers pulled into this area anyway and seemed to have no problem from security (area was never used by Valet). We pulled to the far side next to the abandoned golf course: 32.423918, -86.141143. Security drove by Often, especially in the evening. A little out of the way - small two lane roads getting there - and a bit of a drive to town, groceries and fuel. Nothing special about the casino -- we mostly play tables so did not go in much since slots only. 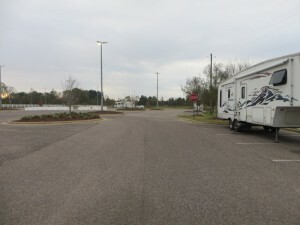 We stayed here since it was closer to Montgomery than VictoryLand but since access was down county roads, Victoryland might have been faster access to Montgomery as it is right off the highway (but further away) -- make your own choice.